Members of the Sicilian-American Society present a check to the Foley Cancer Center at Rutland Regional Medical Center. Front row (L-R): Grace Rizzico and Mary Henrichon. Back row (L-R): Dr. Rick Lovett, Jo-Ann Rotella Ballard, Michael Poalino, Guido Rotella, Jerry Henrichon, Dr. Allan Eisemann and Tom Huebner, pres.and CEO of RRMC. 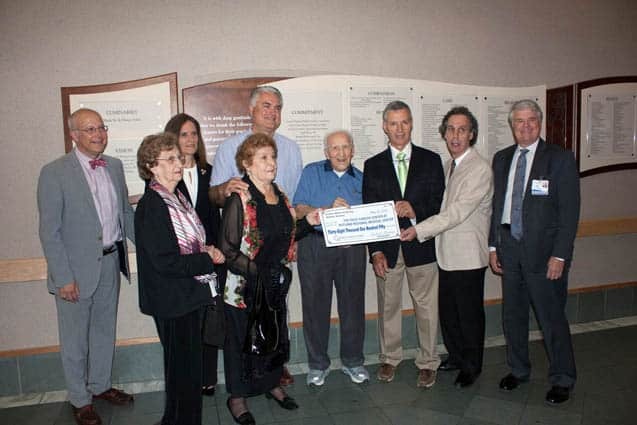 RUTLAND–Members of the recently disbanded Sicilian-American Society gathered outside the Foley Cancer Center to present a check for $38,150 to benefit cancer patients at Rutland Regional Medical Center. The Society started a food co-op and invested dues and profits to establish a scholarship fund and provide financial support for families in need.